A book ought almost to be identified in the dark, merely by the feel or sound of it. Bruce Rogers (1870–1957) was one of the most celebrated book designers of the twentieth century, known for his perfectionism and the “individual treatment” he used with every book he designed (Warde 142). The individual treatment of each book was a result of his mastery of the allusive style which was a relatively new trend in book design. During his lifetime, Rogers designed over 500 books and created two new types called Montaigne and Centaur after the books in which they were first used. His inspiration for these types came from fifteenth- century printer/book designer Nicholas Jenson’s work. Rogers’ career as a book designer began at Riverside Press where he worked for more than fifteen years. However, Rogers spent most of his career working freelance, consulting or designing. After four years working at Riverside Press, a department was created that printed special-edition books and Bruce Rogers was the head of this new department. He employed many styles in the design of these books all with the purpose to “aid reader comprehension by putting books in forms that would have pleased their authors” (Mansbridge 9). This diversity was the essence of allusive design. The book would be designed to cradle the content in a form that would have been used during the time of the author, thus creating a historically appropriate experience for the reader. Stanley Morison describes Roger’s work in allusive design: “Over all this diversity there is a welcome note of grace, airiness and wit …” (Mansbridge 11). Even early in his career at Riverside Rogers rarely made a misstep, and so it is not surprising that he created one of his most well-known works during this time. 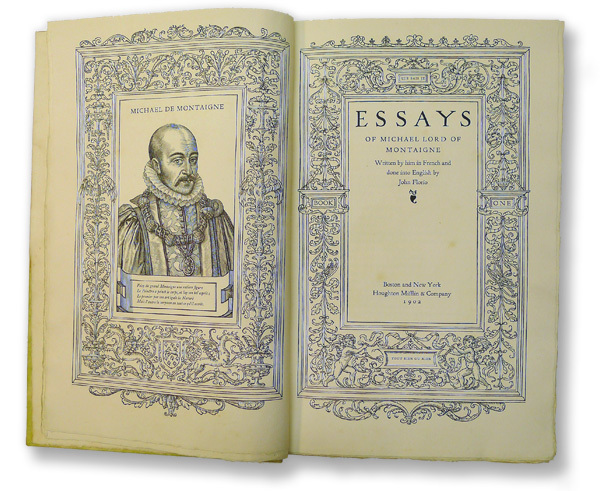 The Essays of Montaigne was designed in 1902 to be a large book in three folio volumes. It was at this point that Rogers tried his hand at type design and so his first type was called Montaigne after the book in which it first appeared. He was, however, not impressed with his first foray saying that the type he designed based on Jenson’s had been “too much improve[d]” (Warde 412). This comment was just further evidence of the perfectionism that made him such a successful designer. Indeed, another example of his perfectionism may be found in the illustrations in the book Geofroy Tory. In order that “the Tory woodcuts would be perfect, each one was photographed and retouched by B.R., an effort which nearly ruined his eyesight and gave him intense headaches” (Mansbridge 16). It is then no surprise that with this temperament Rogers would try his hand at type-design again. Rogers left Riverside Press in 1911 to become the world’s first freelance designer. In his own words he “want[ed] to be a tramp printer” (Warde 146). In 1915 he designed a book called The Centaur for Montague Press. This was the first book in which he used the type he had designed for Henry Watson Kent of the Metropolitan Museum of Art. This type was much more to Rogers’ liking. It was again based on Jenson’s roman letters but this version was “a freehand emphasis of the calligraphic basis of the original” (Morison 42). Combined with the Arrighi italic (re-cut by Frederic Warde) they can be called nothing less than aristocratic. Rogers used Centaur in many of the books he designed, including The Oxford Lectern Bible he completed in 1935. Considered by many to be his most important work, the Bible was designed while he was visiting the UK. It took two years to complete and used the Monotype version of Centaur which had been cut in 1925. Rogers wanted this 12”x16” bible to look like “routine work” (Carter 55). Perhaps because of this, Rogers’ bible has been one of the most well-received bibles in the twentieth century. In his career, Bruce Rogers designed many books that were about the construction of roman letters, four of which are on display: Fra Luca de Pacioli (1933), The Construction of Roman Letters (1924) Champ Fleury (1927), and Champ Rose (1933). The first two may be considered some of his best designs and were included by a man notoriously critical of his own work in his top thirty. Rogers’ top thirty only included the books that he was completely satisfied with. Fra Luca, The Construction of Roman Letters, and Champ Fleury were all commissioned of Rogers by the Grolier Club (Lerner xii). The Grolier Club was formed over 100 years ago to discuss and promote books as art, going so far as to commission beautiful works from designers for this purpose. It is a prestigious club whose members are devoted to the art and design of the book. 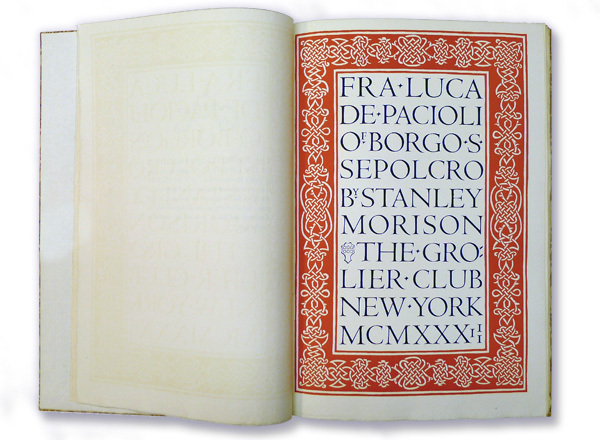 The art and design of Fra Luca de Pacioli by Stanley Morison is bold and unique. It combines type, florets (printer’s ornaments), paper, binding, and superior presswork to create a beautiful, readable book that pays tribute to the masterful and thoughtful content it houses. The type used in Fra Luca is foundry Centaur in 18-pt and it is accented by the florets redrawn by Rogers to showcase the roman alphabet. Rogers’ commitment to allusive typography can be seen with his attention to detail here: “The binding of vellum spine and Florentine paper sides is the perfect manifestation of this reincarnation of renaissance craftsmanship for a fifteenth-century alphabet” (Lerner 24). The ink in Fra Luca is notable for being very rich and dark as can be seen on the remarkable title page. The thick border is quite a deep red, evidence of quality ink and much [re-inking?] since the red typically used for printing is more orange-red. The black ink is its equal, holding its own against the bold border. The ink took a week to dry and the letters often had to be touched up to remove the gloss (Landon 86, 88). However, the true uniqueness of this title page can be seen in Roger’s mixture of large capitals and smaller hand-drawn capitals, an experiment that clearly pays off as it has been called “a page that is unique in the history of printing” (Landon 88). All told, this book is one of Rogers’ most successful designs. The Construction of Roman Letters is a book on a much smaller scale in every aspect. It is a less expensive version of the larger A Just Shaping of Letters. The content is once more dedicated to the display of roman letters, this time drawn by Albrecht Dürer. This book is well-fitted to be held and studied, being smaller than a modern mass market paperback. Once again Centaur is used for the three-page printer’s note written by Bruce Rogers. In this book one may see Rogers’ “mastery of space” in the use to which he put printer’s rules (Landon 62). Six printer’s rules inked in orange-red mark the margins of the page and frame the content. These rules are light in comparison to the images of roman letters which have been re-touched by Rogers in order to darken the ink. The book is printed on hand-made grey-tinted paper with deckled edges which shows off the content and creates a unique experience for the eye. With a fine regard for space and a lack of ornamentation this is one of Bruce Rogers’ simplest and elegant books. Bruce Rogers was part of the movement in the twentieth century that was committed to printing fine press books of a quality not seen in centuries and he was particularly influential in his field. He was committed to allusive typography which may be seen in the many styles of his books, attention to detail, and a commitment to readable works of art. The aristocratic Centaur is a tribute to the earliest days of printing by the inspiration it took from Jenson’s roman type. 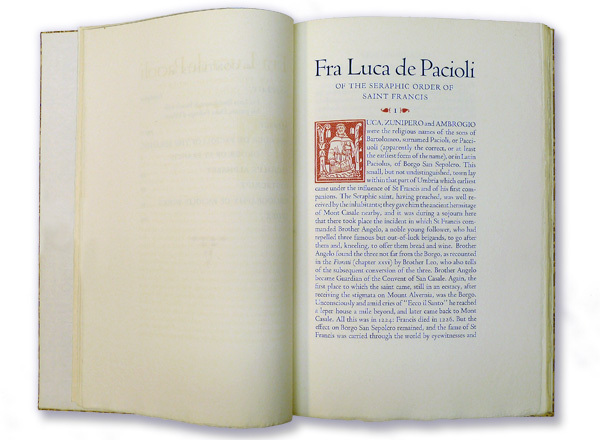 To this day the Oxford Lectern Bible and Fra Luca de Pacioli are examples of the heights to which book design can ascend. Carter, Sebastien. Twentieth Century Type Designers. Hampshire: Lund Humphries, 2002. Morison, Stanley. A Tally of Types. Ed. Brooke Crutchley. New Hampshire: David R. Godine, 1999. Landon, Richard. Humane Letters: Bruce Rogers, Designer of Books and Artist. Toronto: Thomas Fisher Rare Book Library, 2007. Lerner, Abe. BR: A Selection of his books, with comments. New York: The Grolier Club, 1982. Mansbridge, Georgia. Bruce Rogers: American Typographer. New York: The Typophiles, 2007. Warde, Frederic. “On the Work of Bruce Rogers”. 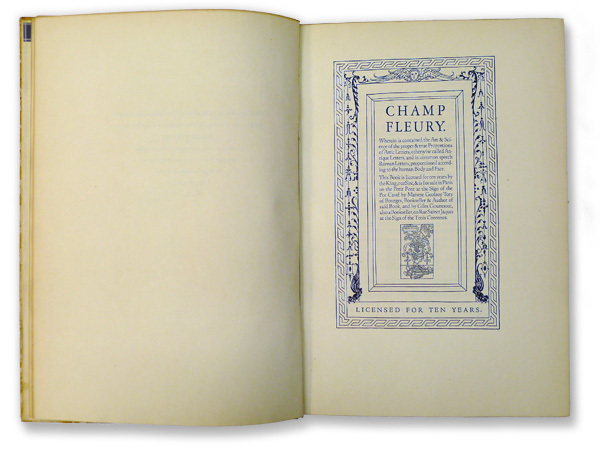 Fleuron Anthology. Boston: D.R. Godine, 1979. In Harvard University Press: A History, editor and historian Max Hall writes, "Bruce Rogers (1870-1957), an urbane, scholarly, meticulous, ingenious, roving man from Indiana, who applied his arts for many publishers and printers on both sides of the Atlantic, is widely considered the first great professional book designer. Some think him the greatest ever." In 1920, Hall notes, when Harvard's press was still both publisher and printer, "Rogers was 49 and had just returned from one of his sojourns in England, where he had been printing adviser to the Cambridge University Press and had put new typographical life into that ancient institution." At the request of its own shop, "the Harvard Corporation created for Rogers the part-time position of printing adviser to Harvard University Press. The connection lasted till 1936, but he served mainly in the eight years from 1920 to 1928. At the outset he spent two or three months helping to reorganize the work of the Printing Office, and thereafter, for years, he was on hand for at least one spell a month. He designed some 30 books for the Press. He also made creative suggestions and generally improved the appearance of the Press's books and catalogues and of the ephemeral printing jobs performed for the University. His very presence in the shop was inspiring." Hall also writes of three Harvard courses in printing and publishing, given by the Business School intermittently from 1910 to 1920. "The Society of Printers helped organize the courses. For the instruction [the society's secretary C.C.] Lane depended upon a parade of distinguished outside lecturers, including D.B. Updike, Bruce Rogers, and William A. Dwiggins, who were to become perhaps the three most honored American book designers." Rogers had come to Boston in 1895 and was hired in 1896 by Houghton Mifflin to design trade books and advertisements at its Riverside Press in Cambridge. In 1900 a special department was established for the design and production of limited editions for sale to collectors. Rogers ran it until 1912. 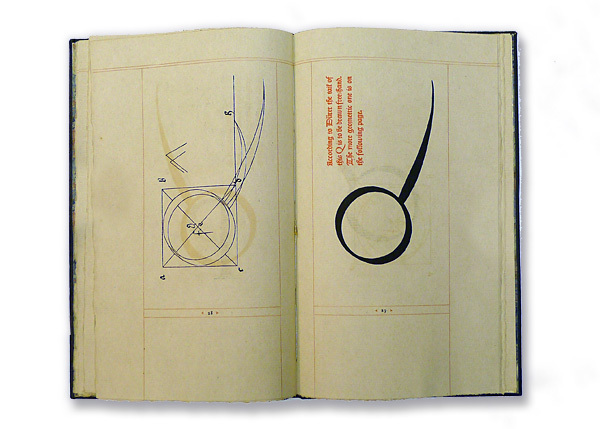 He designed his first type for the printing of a three-volume folio edition, The Essays of Montaigne, which was in the works for three years, 1902 to 1904. He had seen a copy of Nicholas Jenson's 1470 printing of a work by Eusebius in an exhibition at the Boston Public Library and been much taken by its typography. He copied Jenson's letter forms as closely as he could for his new typeface, named Montaigne after the book in which it was first used, as was the typographic custom. But he was never wholly pleased with the cutting of Montaigne. He used the same Jenson model for Centaur, cut a dozen years later, and was satisfied with it. Joseph Blumenthal in The Printed Book in America writes: "Rogers spent the summer of 1912 in England. Unable to make acceptable working arrangements that would also provide a living, he returned to four lean years in the United States. Nevertheless, this period saw the completion of the Centaur type, one of his most brilliant achievements. The Centaur is based closely on the Jenson letter in the Eusebius of 1470, but with considerable freedom in the redrawing. The undertaking was sponsored, with some proprietary rights, by Henry Watson Kent, then secretary of the Metropolitan Museum of Art in New York, where he had established an excellent press in the museum basement for announcements, posters, labels, etc. The type's first book appearance was in Maurice de GuÈrin's The Centaur which gave the type its name and which has become one of the most sought-after of the B.R. books. Hand-set by Mrs. Rogers, it was printed in an edition of 135 copies [in 1915] at Carl P. Rollins' lively and idealistic Montague Press at the Dyke Mill in Massachusetts." The upper-case letters were first used in 1914 by the museum. The complete font was cast for its first use in 1915 in 14 point and was set by hand. It was later issued in several other sizes. At the request of fine printers, Rogers agreed to make the type available in a Monotype version for that company's typesetting machines. The new fonts were first used in 1929. Centaur was roman only, but at Rogers's request, the Monotype version added an italic based on drawings by Frederic Warde. Warde's italic is an interpretation of the work of the sixteenth-century printer and calligrapher Ludovico degli Arrighi and is called Arrighi. In 1948, Rogers wrote and printed a book about Centaur and Arrighi; a reprint of Centaur Types is available from Purdue University Press. 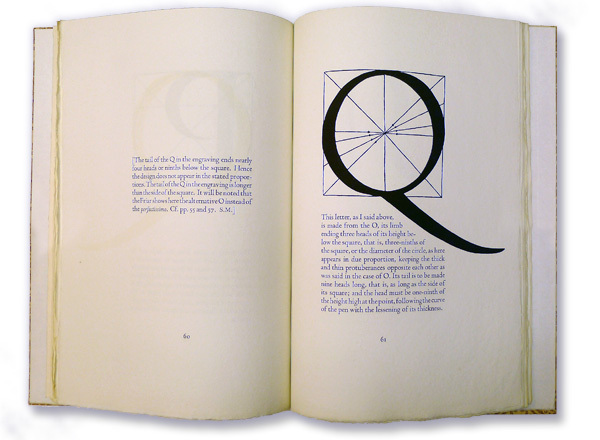 Blumenthal writes about Centaur in his 1977 book: "Centaur is a beautiful type, delicate and subtle, which was made available on Monotype composition. It has never been widely popular in the trade, but has been used with elegant effect by sensitive typographic designers." Daniel Berkeley Updike in his mighty, two-volume Printing Types, first published in 1922, writes: "Mr. Rogers describes the letter as a refinement on his Montaigne type, and thoughóas is his wontóhe sees ways in which this font could be bettered, it appears to me one of the best roman fonts yet designed in Americaóand, of its kind, the best anywhere." Blumenthal's introduction to his long section on Rogers goes as follows: "The forces that converged to produce an American typographic renaissance found [their] finest realization in the work of Bruce RogersÖ.Rogers' earliest masterpieces among the Riverside Press editions were set by hand and printed sheet by sheet on dampened handmade papers. His ultimate triumph, the Oxford Lectern Bible,was entirely a product of the machine, set in type and printed at the Oxford University Press in England. Bruce Rogers' genius was doubly clear in his ability to have crossed over from the frontier of handcraftsmanship to control of the machine, and to have retained artistry and finesse in the transition. His greatness lay in the felicity of his brilliant manipulation of type and ornament, in his command of all the basic processes and their consummation in beautiful booksónoble books that can be read with pleasure and owned with prideónot objets d'art to be stored behind glass. One of the present century's immortals of the printed book, Sir Francis Meynell, producer of the superb procession of Nonesuch Press volumes, made the carefully considered statement that Bruce Rogers ëwas the greatest artificer of the book who ever lived.' Artful devices, subtle stratagems, delicate maneuversóthese are the uses of the artificer, joined under this designer's hand to originality and ingenuity. Add endless variety, novelty, dexterity, and, yes, humor and jeu d'esprit."